When I played the demo of the upcoming Naruto game, NARUTO SHIPPUDEN: Ultimate Ninja® STORM 4, I had only seen early Naruto episodes, and knew who some of the characters were because of conventions. But I immediately understood the epic scope of the battle, and it was evident that there were complex emotional connections between the combatants. These fights were personal, and in that way they were so very different from the waves of dehumanized enemies we come to expect in video games. It's undeniable that Naruto's appeal is tied to visual spectacle and the power to punch and kick things, but that power fantasy is rooted in the desire to protect and preserve, not the need to destroy. To be completely honest though, I wasn't thinking logically at the time. I was thinking "Wow look at those explosions and giant monsters!" as I channeled my inner eight year old. I'm a firm believer that acting like a kid can be healthy straight through adulthood -- the simple virtues we're taught in youth don't become invalid in the complexities of adulthood. Naruto is a hero whose heroism is rooted in kindness and I think this is one of the things that makes the Naruto characters so appealing to cosplayers. Naruto starts his story as an outcast. We're encouraged to laugh at Naruto's bumbling screw ups as he finds his way. It's kind of like the way cosplayers joke about our terrible early costumes. We were so proud of them then. We realize they were so lame now. And because people rejected Naruto, he's driven by an ongoing search for recognition, and that's another thing many cosplayers can relate to. Some normies try to shame cosplayers by claiming we're "doing it for the attention." These haters never define, though, what's wrong with that. Getting attention for achievements isn't a bad thing to want, but it's seen as a bad thing to admit we want that attention. Naruto though? He's totally open about wanting to become Hokage, or village leader. With all the masks people wear in Naruto, his frankness about his ambitions makes him lovable. The simple motivations of shonen manga characters like Naruto resonate because they speak to simple, near-universal desires. Which might be why so many adults watch anime, read manga, and cosplay characters made for kids. The amount of Naruto cosplay out there is a big sign of this popularity. Naruto provides some things for young men in particular that Western media often doesn't. Western superhero media often show immaturity, self-destructive habits, and "clever" rudeness as aspirational antihero virtues. Shonen manga, on the other hand, is marked by the hero seeking to better himself. Naruto learns that work and discipline, as well as loyalty, kindness, and selflessness, are essential to strength. As the series progressed, Naruto stories developed an exceptionally deep emotional core that manifested itself in the divergent paths of Naruto and his rival, Sasuke. While Naruto is warm and goofy, Sasuke is detached and cold, and while both seek power, the different ways they seek power resonate with cosplayers, especially in pairs and group cosplays. Sasuke really isn't a bad guy deep down. He just made some bad choices, and got manipulated. With the modern world so polarized, it's nice to play in a world where opponents aren't seen as evil incarnate. Unlike many Western villains who have little real motivation beyond being evil, Naruto villains have clear codes of honor, even if they're warped. Within the childlike mindset of Naruto, we can remind our big kid selves that those who oppose us are still human beings. People we dislike, or who are working toward divergent goals, often still mean well, and Sasuke, to me, is an embodiment of that. Sasuke cosplayers talk about relating to keeping a distance from the world. I don't hear often that they picked that character because they wanted to be the bad guy. Whenever Naruto and Sasuke square off, there's a huge amount of emotion involved in their battle. Cosplayers love those feels! Cosplay is a way to express things that you normally have to keep hidden. 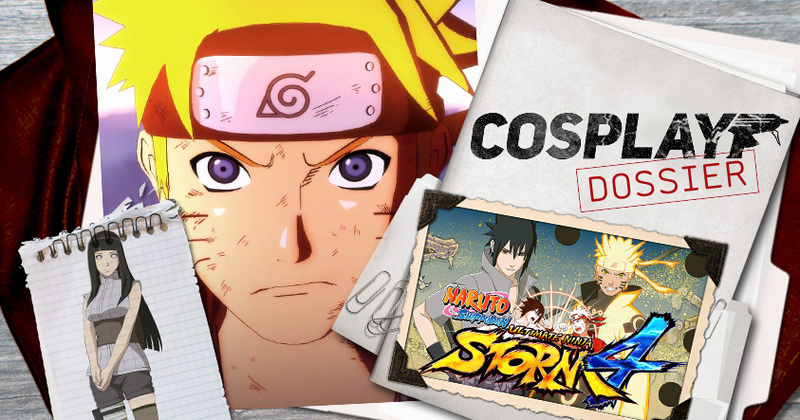 Like Naruto, many cosplayers feel like there's something inside them that they can't let out very often. One can think of cosplay as someone's "Tailed Beast Mode," a form Naruto acquires after the dangerous beast spirit inside him sees his resolve to help and save others. A lot of cosplayers are bullied and made to feel bad about the creativity they want to express, and I think that boys, especially, are discouraged from showing artistic and sensitive sides. It's no surprise, based on this, that many young men flock to shonen stories like Naruto that give them the freedom to be emotionally exposed and strong at the same time. The amount of emotion seems to draw in female cosplayers as well. A cosplayer can capture Naruto's goofiness, Sasuke's detachment, Tobi's mystery, and Madara's madness in poses and photographs. Someone unfamiliar with the characters' lengthy backstories can still understand the basics. It's not so dense that people get lost, even though Naruto stories have been produced for decades now. Self-styled sophisticates often dismiss things simply because they're simple, but I think there's a value in the simplicity. The enduring popularity of Naruto shows that there's a great many people out there who still want to see kindness and hard work as virtues instead of a weaknesses. Naruto is a shonen property that is childlike as opposed to childish, and we can all benefit from getting over ourselves from time to time, dream of being a powerful hero, and play "like boys." This article was written thanks to a sponsorship from Bandai Namco. NARUTO SHIPPUDEN: Ultimate Ninja® STORM 4 is available February 9th, 2016 on PS4, Xbox One and STEAM. 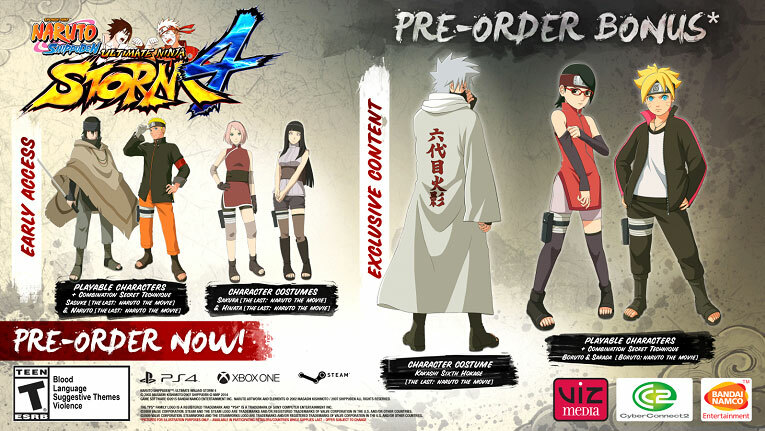 Get the Boruto and The Last DLC packs exclusively with pre-order while supplies last at participating retailers.